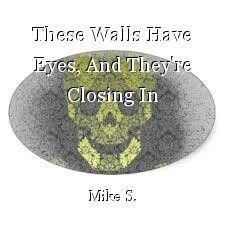 These Walls Have Eyes, And They're Closing In, poem by Mike S.
these pitiless walls of my cage. I feel I'm losing these battles, the war that I wage. I know that feeling very well, Mike. Soon be over one way or another. Thanks, Hully, but I'm not really talking about the windstorm, it's everything. I feel like it's almost time to pay the piper.